Seasonal produce from various regions of B.C. is easy with organizations like Farm Folk, City Folk who connect urban citizens to farmers and farmers' markets in their communities. From Richmond to Penticton, grazing up and down along market tables loaded with vibrant greens, purples, oranges and reds in shapes and hues foreign from larger grocery chain stockpiles, you can hear some shoppers exclaim excitedly "What is this?!" "What can I do with this?!" As snow melts away for warming soil, trees have begun to bear new buds as Mother Nature awakes from her winter sleep. Spring harvest has started its rebirth across the British Columbia and the fertile soil beneath this beautiful province is providing some impressive edible offerings. Depending where you are in the northern hemisphere, spring produce includes treats like: apples, arugula, asparagus, chard, fava beans, scallions, rhubarb, spring peas, leeks, beets, endives, artichokes, broccoli sprouts, and celery root. Don't forget the biennial carrots and perennial potatoes left germinating from the fall too. 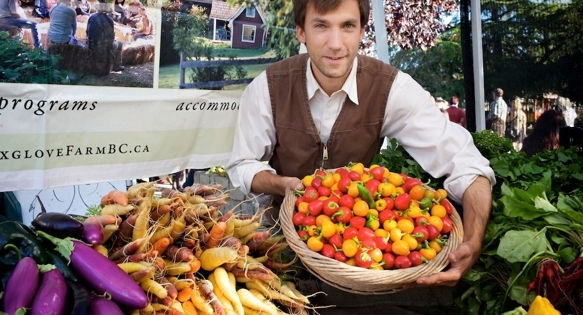 Sourcing seasonal produce from various regions of B.C. 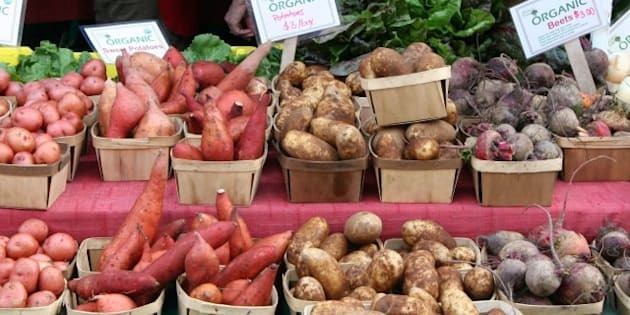 is easy with organizations like Farm Folk, City Folk who connect urban citizens to farmers and farmers' markets in their communities. From Richmond to Penticton, grazing up and down along market tables loaded with vibrant greens, purples, oranges and reds in shapes and hues foreign from larger grocery chain stockpiles, you can hear some shoppers exclaim excitedly "What is this?!" "What can I do with this?!" A few key players in B.C. 's farming, food and media families offer their favourite recipes using current seasonal produce to "spring" you forward with a full belly into the warmer months ahead. Mince garlic and shallot, combine with Dijon, vinegar and honey and mix. Drizzle olive oil into other ingredients; whisk. Add salt and pepper to taste. Blanch asparagus in salt water for about 30 seconds, then place in ice water. Preheat grill to high. Add asparagus and turn periodically, grilling to desired readiness. Plate, finish with drizzles of lemon juice and vinaigrette and garnish with pine nuts and Parmesan. Serve hot or cold. Vinaigrette: Put vanilla bean in a pot with the apple cider vinegar. Bring to a boil, remove the bean, and then cool the mixture. Combine everything together with a hand blender. Extra dressing can be stored in an airtight container in the refrigerator. Arrange all the lettuces on individual plates or a platter for family style. Toss the apples, celery leaves, celery hearts, Italian parsley, blue cheese and hazelnuts with the vinaigrette. Place on top of the lettuce and serve. Soak chive blossoms in cold water. Spin in a salad spinner to dry and place in a 1 litre jar (the jar should be 1/2 to 2/3 full). Fill jar with white wine vinegar. Close tightly and let sit in a cool dark place for a 2 weeks. Strain through a coffee filter or cheese cloth into a new sterilized bottle. Preheat oven to 375 F. Butter the bottom and sides of a 9″ x 13″ (approx.) metal or glass pan. In a large bowl combine all ingredients. Mix with your fingers until the mixture resembles fine crumbs. Butter should be completely incorporated. (You can use a food processor for this step, if you like). Press crumbs (not too too firmly, but firm enough) into the bottom of the prepared pan. Press a tiny bit up the sides of the pan as well. Place pan on lower-centre rack of the preheated oven. Bake for 20 to 30 minutes, until golden. Remove from oven and reduce oven heat to 350 F.
While the crust is baking, mix the topping ingredients together. In a large bowl, mix the sugar, eggs, flour, vanilla, salt, and whipping cream, whisking well to eliminate lumps. 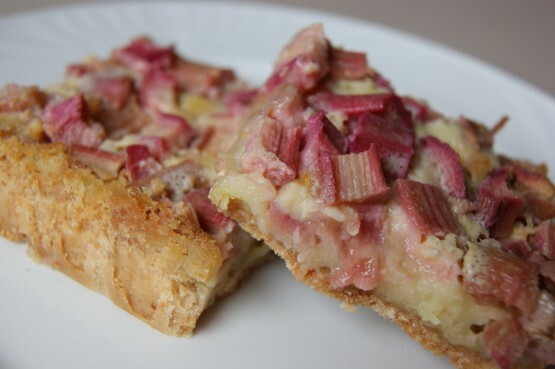 Stir in the diced rhubarb. Once the crust comes out of the oven, pour the topping over it (the crust should still be warm). Return to the oven and bake for 30-40 minutes, until custard no longer jiggles and toothpick inserted in the middle comes out mostly clean. Let cool. Cut into bars. Wash fiddleheads thoroughly to remove dirt. In large pot of boiling, salted water, blanch fiddleheads for 3 minutes. Drain in a colander, refresh under cold water and drain well again. Set aside. In large skillet over medium heat, cook bacon, stirring occasionally, until crisp; remove bacon with slotted spoon and drain on paper towels. Chop into bits. Pour off all but 2 tsp (10 mL.) fat. Increase heat to medium-high and melt butter in fat. Sauté shallots and garlic until shallots are transparent and soft. Add fiddleheads and sauté 5 minutes. Remove from heat and season with salt and pepper. Serve topped with bacon bits.